(Nov. 3, 2016) - A quarter million trees drop a lot of leaves – and when they fall in an urban environment, it's necessary to clean them up. That’s why PBOT’s Leaf Day program is so important. From mid-November to mid-December, removing leaves from our streets is critical because letting them stay on the street can clog storm drains, flood intersections and make streets slippery. Leaf Dayis designed to clear our streets of many of the leaves that fall as the season changes. By participating in Leaf Day, you help to ensure safer and cleaner streets for you, your neighbors and all Portlanders. Leaf Day is starting later. We heard you. We’ll be starting Leaf Day two weeks later this year to allow for more leaves to fall ahead of our first pickup day on November 12. New Leaf Day districts. We’ve reconfigured the Leaf Day service districts to be smaller, which allows for more flexibility and better responsiveness. Fewer Sunday pickups, no Thanksgiving weekend pickups. That means less noise in neighborhoods on the weekend and a quiet Thanksgiving holiday for all. Digital reminders! Stay in the loop about Leaf Day by signing up for weekly email and/or text message updates with schedules and tips for making the most of your Leaf Day service. Visit us online at portlandoregon.gov/leafday to confirm which Leaf Day Service Zone you’re in, and when your service will be. Our regular Leaf Day service clears your street tree leaves, but what about tree leaves on the sidewalk or elsewhere on your property? No problem: we’ll take those, too. 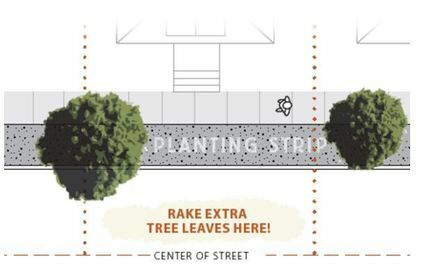 Simply rake them into the street the day before your Leaf Day(s). Remember: only tree leaves, not any other kind of yard debris. Help us help you! Remove obstacles like basketball hoops from the street, cut tree branches lower than eleven feet from the ground (our machines are tall) and relocate your vehicles off the road on your Leaf Day. 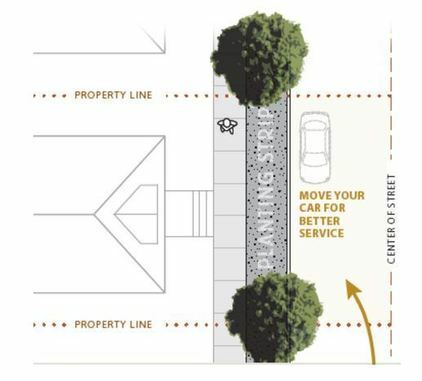 By doing these things, you’ll make it easier for our machines to hug the curb and get your street cleaner as a result. We value your thoughts and hope these changes make Leaf Day easier for everyone. As always, we would like to hear your feedback. If you have an idea or a complaint, please call 503-865-LEAF or email leafday@portlandoregon.gov.